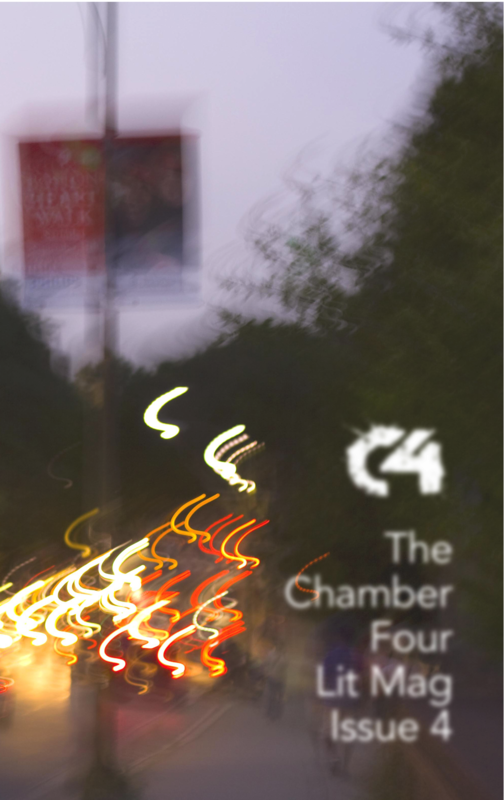 Welcome to the hub page for C4: The Chamber Four Lit Mag, Issue #4. The fourth issue of Chamber Four’s literary magazine features all-new fiction, nonfiction, poetry, and plays by award winners and first-timers alike. C4 strives to the best lit mag you haven’t heard of but should be reading. It’s free to download and DRM-free to boot. Order a copy of the paperback edition and the Harvard Book Store will print one just for you and ship it to your door. It’s only $14! Below is a list of every story in the anthology, in the order in which they appear. Click the title of the story to see its original home on the web. Click the name of the author to see their bio on this page. Click the title of the magazine to visit that magazine’s home page. Use your browser’s back button to navigate back. David S. Atkinson is the author of Bones Buried in the Dirt (River Otter Press 2013). His writing appears in Bartleby Snopes, gray Sparrow Journal, Interrobang?! Magazine, Atticus Review, and others. His writing website is http://davidsatkinsonwriting.com/ and he spends his non-literary time working as a patent attorney in Denver. LaShonda Katrice Barnett is the author of the story collection Callaloo and editor of I Got Thunder: Black Women Songwriters On Their Craft and the forthcoming Off The Record: Conversations with African American & Brazilian Women Musicians (Rowman & Littlefield, 2014). She is a past fellow of the Sewanee Writers Conference and Provincetown Fine Arts Center. Find her on the web at lashondabarnett.com and https://twitter.com/lashondakatrice. Cory Bradley is a self-published novelist and short story writer living on the Olympic Peninsula in Washington State. Publication credits include short stories published in the print journals The Salal Review and The Rock Creek Review, and a flash fiction vignette recently accepted for publication by the literary magazine C4. Much of his fiction draws from experiences collected during travels to the United Kingdom, Ireland and Japan. When he is not busy with a writing project he is either playing music, reading no fewer than three books at a time or losing gracelessly to his wife Jina at whatever game they happen to be addicted to. Maria Brandt received her PhD in English from Boston College in 2003 and is Assistant Professor of English at Monroe Community College in Rochester, New York, where she teaches American Literature Since 1865, Women in Literature, Dramatic Literature, and Creative Writing. At MCC, Maria also runs a fledgling Creative Writing program, directs the award-winning interdisciplinary drama initiative The Sixth Act, and has won both the NISOD Excellence in Teaching Award and the Hanson Excellence in Teaching Award. She published “‘The Man in the Family’: Staging Gender in Waiting for Lefty and American Social Protest Theatre” in Critical Approaches to American Working-Class Literature (Routledge 2011) and “‘For His Own Satisfaction’: Eliminating the New Woman Figure in McTeague” in American Transcendental Quarterly (2004). Her short play “Santa’s Baby” was produced by The Bridge Theatre Company in Boston and placed as a finalist for the Genesee Reading Series; “The Root People” has placed in several nationwide competitions, was produced during the Boog City Poetry Festival in Greenwich Village, and was published in Shark Reef Literary Magazine’s Summer 2012 issue; “The Next Thing” was co-produced as a reading by Geva Theatre Center and Writers and Books in Rochester, NY; and “Relativity” placed as a semi-finalist for the Subversive Shorts Festival in Buffalo, NY. Maria is currently working on a novel and a short-play cycle focusing on different regions across New York State. Clark E. Clark lives in Laramie, Wyoming, where he is completing a book of portraits in praise of unfamous men. His essays have appeared in The Antioch Review, CutBank, Fourth Genre, Wag’s Revue and others. Thomas Cowell from Washington State has had three short stories recently published with Torrid Literature Journal, Storychord, and Gravel, respectively, and another forthcoming in The Milo Review. Libby Cudmore’s stories and essays have appeared in Big Lucks, The Vestal Review, Pank, The Citron Review, Kneejerk, Connotation Press, Postcard Press, Umbrella Factory, Independent Ink, The MacGuffin, The Yalobusha Review, The Chaffey Review, and The Southern Women’s Review, as well as The Writer, Mixitini Matrix and ARCANE II (with Matthew Quinn Martin). She is currently spending a year living by vintage beauty and dating guides at www.geekgirlgoesglam.com. Paul Dickey’s second full-length book of poetry Wires Over the Homeplace is being published this summer by Pinyon Publishing. His poetry has appeared recently in 32 Poems, Pleiades, Prairie Schooner, the Hampden-Sydney Poetry Review, the Bellevue Literary Review, among other online and print publications. His first full-length book of poetry They Say This is How Death Came Into the World was published by Mayapple Press in January, 2011. Biographical information and additional notes on previous publishing activity can be found at http://www.pw.org/content/paul_dickey. Colin Dodds grew up in Massachusetts and completed his education in New York City. He’s the author of several novels, including The Last Bad Job, which the late Norman Mailer touted as showing “something that very few writers have; a species of inner talent that owes very little to other people.” Dodds’ screenplay, “Refreshment–A Tragedy,” was named a semi-finalist in 2010 American Zoetrope Contest. His poetry has appeared in more than ninety publications, and has been nominated for the Pushcart Prize. He lives in Brooklyn, New York, with his wife Samantha. Robert Earle’s short stories and novellas have appeared in more than fifty literary journals across the U.S. and Canada. He also is the author of two novels, The Way Home and The Man Clothed in Linen, and two books of nonfiction, Nights in the Pink Motel and Identities in North America. For twenty years he was a diplomat; now he is settled in Virginia. Several years ago, Debra M. Fox started writing poems, and was delighted when some were accepted for publication in various haiku journals. While continuing to write poems, she also enjoys writing short stories and essays. Her works have been accepted in Hyperlexia Journal, Blue Lyra Review, Squalorly, The Meadow, Burrows Press Review, and Embodied Effigies. She is the Director of an adoption agency, and a lawyer. In her spare time, she loves to dance. Bob Meszaros taught English at Hamden High School in Hamden, Connecticut, for thirty-two years. He retired from high school teaching in June of 1999. During the 70s and 80s his poems appeared in a number of literary journals, such as En Passant and Voices International. In the year 2000 he began teaching part time at Quinnipiac University, and he began once again to submit his work for publication. His poems have subsequently appeared in The Connecticut Review, Main Street Rag, Tar River Poetry, Concho River Review, Northwind, Innisfree, and other literary journals. J.R. Miller was born and raised in the blue-collar suburbs of Detroit. After several years of working in advertising and joined by his wife and children, he moved to Florida. He received his MFA from the University of South Florida. His work has been published by Midwestern Gothic, Palooka, Prime Number, Prick of the Spindle, Stymie, Alligator Juniper, Fiction Fix and in the anthology, Tigertail: A South Florida Annual. He is the Co-Founding editor of ĕm: A Review of Text and Image and Graphic Nonfiction editor for Sweet: a Literary Confection. You can visit his website at www.miller580.com. Ron Morita received a Masters in biomedical engineering from Case Western Reserve and is an electrical engineer. His short short story “The Writer” appeared in the Summer 2013 issue of Cigale Literary Magazine. His flash story “The Winner” appeared in Issue 10 of Penduline Literary Magazine. He has four unpublished novels. Celina’s Gift is an exposé on fire alarm reliability. In Mother, robots are poised to take over his world. The Hoist looks at the manic robotics industry. The Bag Lady and the Face describes the flight of two lovers from an all-powerful Church. Ron’s Facebook page is http://www.facebook.com/RonMoritaStories. Steven Ostrowski is a poet, fiction writer, playwright, and songwriter. His work has appeared widely in print and in online literary journals and magazines. Recent work appears in WIPs Works (of Fiction) in Progress, Literary Orphans, Prism Review, Coe Review, Citron Review, and others. His music videos can be viewed on YouTube. He teaches at Central Connecticut State University. John Palen’s Open Communion: New and Selected Poems was published by Mayapple Press in 2005. Since then he has had chapbooks published by March Street Press and Pudding House, and poetry, fiction and memoir appearing or forthcoming in Sleet, Prick of the Spindle, Gulf Stream, Citron Review, Lingerpost, Upstreet, Elder Mountain, and other publications. He lives in Central Illinois. Tanya Perkins lives in a small Midwest town with spouse, daughter and various animals. She teaches writing at Indiana University East. Her poetry and fiction have appeared in Sliver of Stone, Emrys, Wilderness House Literary Review, Arcadia, and other venues. She has no tattoos currently but that could change. Frederick Pollack is the author of two book-length narrative poems, The Adventure and Happiness, both published by Story Line Press. Other poems in print and online journals. Adjunct professor creative writing George Washington University. Jeremy Schnee received his MFA from Colorado State University. His short stories have appeared in The Cottonwood Review and 303 Magazine. He works in a flour mill, and he’s almost finished writing his first novel. For more about Jeremy’s fiction, visit www.jeremyschnee.com. Robert Joe Stout’s articles, poetry and stories have appeared in many publications including The American Scholar, America, South Dakota Review, Illya’s Honey and Notre Dame Magazine. He is the author of The Blood of the Serpent: Mexican Lives, Why Immigrants Come to America and Running Out the Hurt. Anne-Marie Thweatt is a writer and writing teacher living on the desert border of Mexico in Yuma, AZ. She has studied under several great writers including Barbara Ungar, Daniel Nestor, and Rick Moody. Her work has recently been published in Flare: The Flagler Review, and is forthcoming this fall in Sleet Magazine. Graham Tugwell is an Irish writer and performer and recipient of the College Green Literary Prize 2010. Over eighty of his short stories have been published, appearing in Anobium, The Missing Slate, The Quotable, Pyrta, Jersey Devil Press, L’Allure Des Mots and Poddle. He has lived his whole life in the village where his stories take place. He loves it with a very special kind of hate. His website is grahamtugwell.com. Bill Wolak has just published his ninth book of poetry entitled The Art of Invisibility with Feral Press. Recently, he was a featured poet at The Hyderabad Literary Festival. Mr. Wolak teaches Creative Writing at William Paterson University in New Jersey.